My Rag Rugs are made of cotton and cotton-blend fabrics. I pre-shrink all materials, the rug will not shrink when it is washed. All materials are hand cut. Several of the patterns demand strips of cloth cut to specific length. I often work in designer colors on custom orders. Many sizes are available. From 2' x 5' to stair runners or room size carpets. 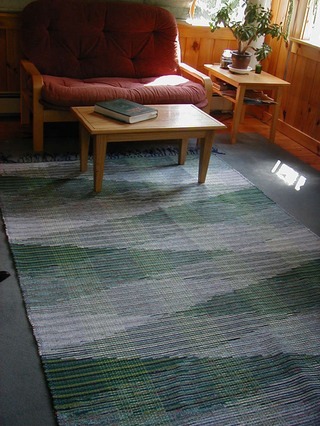 Larger rugs are woven in panels and then stitched together. All are washable; the smaller ones in the machine, larger rugs should be washed by hand or professionally. They can also be vacuumed using a floor brush. Visit the Rug Gallery to see the standard patterns, and the custom Gallery to see larger carpets. There are five basic design patterns. After many years of taking custom orders, I have recently cut back and only accept orders that challenge or interest me. I will choose fabrics and yarns to match your color selections. There is a $50.00 design fee. A design includes samples of yarns and fabrics for your approval. A rug is commissioned by returning a 50% deposit. Rugs are priced from $32-42.oo a square foot. Rugs over three (3) feet in width are woven in panels and stitched together. 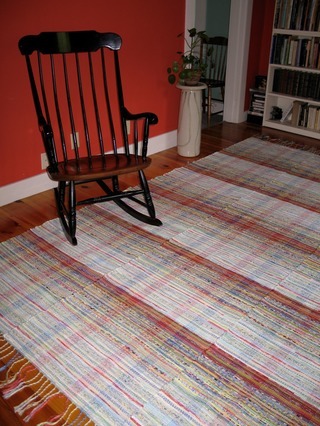 Larger One-of-a-kind rugs may be priced individually as time and materials require.